An active solfataric field was detected in one of Tolguaca's NW craters (at 38.29°S, 71.67°W) during a March 1986-January 1987 geologic study. Several vents up to 2 m wide covered an area of ~200 m2. The vents emitted boiling water, high pressure steam, and H2S, with a jet-like noise. The entire area showed intense alteration and a small amount of sulfur deposition. The Global Volcanism Program has no Weekly Reports available for Tolhuaca. Tolhuaca (or Tolguaca) is a late-Pleistocene to Holocene stratovolcano located immediately NW of Lonquimay volcano. A NW-SE zone of aligned summit craters is youngest to the NW. Another group of vents cutting the south and east flanks is oriented SW-NE, parallel to the zone of flank vents on Lonquimay, and is of post-glacial age (Moreno and Gardeweg 1989). Reports of eruptions in 1876 and on 7 January 1933 are not confirmed; the latter date probably refers to an eruption of Lonquimay or Llaima (Petit-Breuilh 1994, pers. comm.). Polanco et al. (2000) stated that explosive activity consisted of three VEI 3-4 eruptions between 8050 and 6590 BP. The Pemehue volcanic trend on the NW flank was noted by Naranjo (pers. comm. 2010) in Melosh et al. (2012) as having post-glacial lava flows dated at less than 6,000 years old. Only fumarolic activity has occurred from this basaltic-andesitic volcano during historical time. Fumaroles and hot springs are common across the NW flank where there is an active geothermal reservoir (Melosh et al., 2012). Melosh G, Moore J, Stacey R, 2012. Natural reservoir evolution on the Tolhuaca Geothermal Field, southern Chile. PROCEEDINGS, Thirty-Sixth Workshop on Geothermal Reservoir Engineering, Stanford University, Stanford, California, January 30-February 1, 2012. Moreno H, Gardeweg M C, 1989. La erupcion reciente en el complejo volcanico Lonquimay (Diciembre 1988-), Andes del Sur. Rev Geol Chile, 16: 93-117. Petit-Breuihl M E, 1994. (pers. comm.). Polanco E, Naranjo J A, Young S, Moreno H, 2000. Volcanismo explosive Holoceno en la Cuenca del alto Biobio, Andes del Sur (37°45’-30°30’S). IX Congreso Geologico Chileno, 31 Julio-4 Agosto, 2000. Puerto Varas, Chile. There is no Deformation History data available for Tolhuaca. There is no Emissions History data available for Tolhuaca. Tolguaca volcano, the snow-capped peak at the left, is a late-Pleistocene to Holocene stratovolcano located immediately NW of Lonquimay volcano. 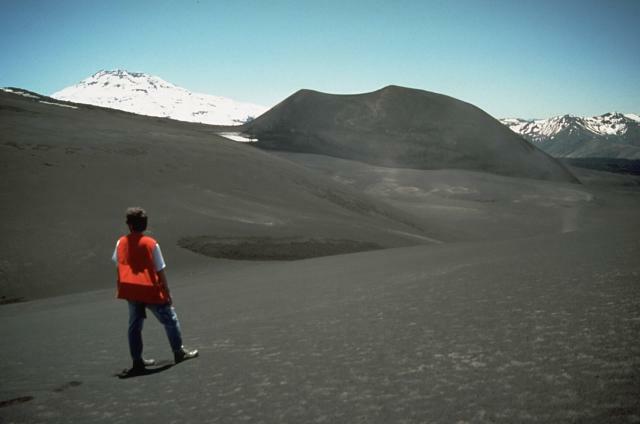 The cinder cone at the right in this view from the SE is the Navidad cone on the NE flank of Lonquimay, which formed during an eruption in 1989. The 2806-m-high Tolguaca is older than its neighbor Lonquimay. It is dissected by glaciers and only fumarolic activity has occurred during historical time. Flank vents are oriented NW-SE, in line with Lonquimay, and SW-NE-trending vents occur on the south flank. There are no samples for Tolhuaca in the Smithsonian's NMNH Department of Mineral Sciences Rock and Ore collection. Large Eruptions of Tolhuaca Information about large Quaternary eruptions (VEI >= 4) is cataloged in the Large Magnitude Explosive Volcanic Eruptions (LaMEVE) database of the Volcano Global Risk Identification and Analysis Project (VOGRIPA).